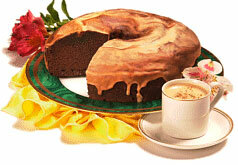 The photo above is a all chocolate version of this pound cake, but this lovely coffee and chocolate blend is delightful. Preheat oven to 350°F (180°C). Butter and flour a 10-inch Bundt pan or tube pan. Combine flour, baking powder and salt in a bowl and set aside. In a large mixing bowl, cream butter and sugar until light and fluffy. Add the eggs, beating in after each. Add milk, coffee dissolved in water, and vanilla; mix well. Gradually beat in flour mixture. Pour half of the batter into prepared pan. Sprinkle the chocolate chips and 1 1/2 teaspoons of coffee evenly over batter. Gently swirl the chips and coffee powder through the batter with a knife. Cover wirh remaining batter. Bake 35-45 minutes or until a toothpick inserted in center comes out clean. Cool on wire rack. Turn the cake out on a serving platter with fluted side up. Dust with sifted confectioners' sugar and sprinkle with cinnamon, or drizzle with a mocha flavored glaze. Great recipe. it came out amazing and the flavour was awesome.